Ramada San Antonio/Near Sea World is located minutes from Sea World San Antonio and Lackland Air Force Base. Six Flags Fiesta Texas and Downtown San Antonio, home of the famed Alamo and Riverwalk Paseo Del Rio, are a few miles from the Ramada. There are 5 restaurants adjacent to the Ramada. 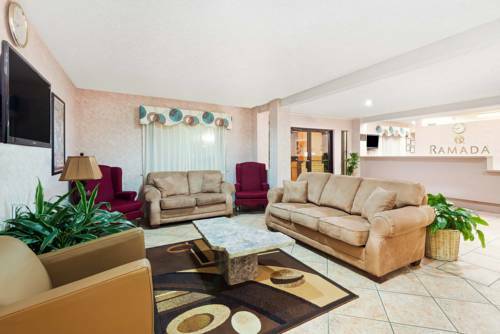 The hotel features a free parking, business center, free hot breakfast every morning, an outdoor pool and sun deck, and free Wi-Fi available to our guests. Guest rooms are also equipped with a 37 inch TVs with 75 channels - including SHOWTIME and laptop size safe for a nominal fee. Free hot breakfast with waffles, egg patties, and biscuits. RamadaMart is located in lobby for convenience items, snacks, ice cream, sundries. The Ramada has free at-your-guestroom-door parking. Sorry but we do not accept pets. Please note, during March, June, July and August--Guests reserving Federal or State Government Rates must present Government ID at check-in together with Government Travel Orders.